MicroElectronic Systems” have successfully created a chip that controls the brain and can be used as a storage device for long-term memories. In studies the scientists have been able to record, download and transfer memories into other hosts with the same chip implanted. The advancement in technology brings the world one step closer to a global police state and the reality of absolute mind control. SINGAPORE: A Danish national has filed a writ against Alexandra Hospital (AH) for allegedly planting a microchip in him during a 1988 operation, which he claimed later caused him mental distress due to being constantly monitored. According to court papers filed in the High Court on June 21 against AH, which has been managed by Jurong Health Services since August last year, Mr Mogens Tindhof Honore said he first found a metal instrument akin to a microchip in his left lung after an X-ray scan in 1997. Mr Honore, 54, added the metal piece was implanted in him during an operation at AH more than two decades ago - the last time he had undergone surgery in his chest and lung. Represented by lawyer Oliver Quek, the former seaman said that he was stabbed in the lung in May 1988. After his discharge, he kept hearing voices in his head and could not lead a normal life. He would also feel generally unwell and would even cough out blood. "(Mr Honore) also discovered and experienced that strange people on the streets would approach and speak to (him) about strange subject matters or pass strange irrelevant comments," according to the papers filed. Mr Honore said that his subsequent discovery of being constantly tracked left him in a "perpetual state of apprehension and fear for the safety of his life". It also prevented him from holding on to a job. When he returned to Singapore in December last year to investigate his condition, he claimed that he was turned away by AH which said it had no records of his stay. He claimed that two X-ray scans later on May 9 this year at AH and Mount Elizabeth Hospital found the metal fragment (microchip) in his left chest wall instead of his left lung. He also claimed that, earlier this month, he underwent an operation at Mount Elizabeth Hospital to remove the fragment. In his lawsuit, Mr Honore is now alleging that employees of AH who had then operated on him implanted the microchip in him intentionally, causing "exceptional harm and lifelong suffering". He also said that the alleged act constitutes a trespass on his body. Mr Honore claims that he suffers from various conditions following the alleged act, such as impairment of relationship, loss of enjoyment of life and suicidal thoughts. Seeking damages for expenses incurred such as psychiatric help and medication, he is also alleging that AH medical staff who tended to him were negligent. He said that the staff was careless in placing a metal fragment in his left chest wall during the operation, resulting in harm and injury. Responding to media queries, AH director of communications and service quality Casey Chang said: "We understand that the patient had recently returned to Alexandra Hospital to seek information regarding medical treatment he had received at Alexandra Hospital in May 1988. This was 23 years ago when Alexandra Hospital was a government hospital." She added that, after the hospital was informed of the lawsuit, AH has taken steps to convey to the patient's lawyer (Mr Quek) that Jurong Health Services Pte Ltd has been wrongly identified as the defendant in the suit. At the time Mr Honore was treated in AH in 1988, the hospital was under the Ministry of Health. For instance, with stories like the recent Singularity Hub article entitled, “Revolutionary New Brain Chip Allows Monkeys To Grasp AND Feel Objects Using Their Thoughts,” these emerging technological possibilities are almost impossible to ignore. Brandon Turbeville is an author out of Mullins, South Carolina. He has a Bachelor’s Degree from Francis Marion University where he earned the Pee Dee Electric Scholar’s Award as an undergraduate. He has had numerous articles published dealing with a wide variety of subjects including health, economics, and civil liberties. He also the author of Codex Alimentarius - The End of Health Freedom, 7 Real Conspiracies and Five Sense Solutions. Hey, Remember When Newt Gingrich Was Sponsored By a Human Chip-Implant Company? (MoneyWatch) Republican presidential candidate Newt Gingrich once spoke at an Alzheimer's conference sponsored by PositiveID (PSID), the human microchip implant company that came under fire for injecting 200 Alzheimer's patients with wireless chips in Florida without properly obtaining their consent. Naturally, conservatives and privacy advocates were appalled. Thompson has not yet announced whether he will run. Gingrich, obviously, is already campaigning for the White House in 2012. His campaign faltered recently when he criticized the House GOP Medicare reform plan as an example of "right-wing social engineering." Many conservatives similarly believe that implanted health record microchips are a gross invasion of privacy. In this role, Mr. Silverman and PositiveID partnered with the Center for Health Transformation to bring Former Speaker of the U.S. House of Representatives and Founder, Center for Health transformation, Newt Gingrich as the keynote speaker. patients and their guardians, the foundation stated. This value case should integrate systems to enhance the interoperability of electronic health records across traditional healthcare providers and with community agencies that provide key services to individuals and their caregivers. As noted by the Medicare Payment Advisory Commission, interoperable, standards based electronic health information systems and health records are a critical infrastructure for delivering such care. However, it is essential that this infrastructure be designed to effectively address the challenges that health professionals encounter when providing care to patients with dementia. Thompson left the board of VeriChip in 2007 and apparently did not get a chip himself. Aim of the project: to overcome the existent limitations of the current approaches to ethical governance in projects with technical development. NEW YORK (Reuters) - Novartis AG plans to seek regulatory approval within 18 months for a pioneering tablet containing an embedded microchip, bringing the concept of "smart-pill" technology a step closer. The biotech start-up's ingestible chips are activated by stomach acid and send information to a small patch worn on the patient's skin, which can transmit data to a smartphone or send it over the Internet to a doctor. Mundel said the initial project was focused on ensuring that patients took drugs at the right time and got the dose they needed -- a key issue for people after kidney and other transplant operations, when treatment frequently needs adjustment. Longer-term, he hopes to expand the "smart pill" concept to other types of medicine and use the wealth of biometric information the Proteus chip can collect, from heart rate and temperature to body movement, to check that drugs are working properly. A bigger issue may be what checks should be put in place to protect patients' personal medical data as it is transmitted from inside their bodies by wireless and Bluetooth. "The regulators all like the concept and have been very encouraging. But ... they want to understand how we are going to solve the data privacy issues," Mundel said. Dr. Gary Marcus, a psychology professor at New York University, tells Big Think that we should develop a "Google-like" chip to implant in our brains that would use our neurons like a search engine and enhance human memory. Marcus developed the idea for a memory-enhancing brain chip after writing his 2008 book "Kluge" (whose title refers to the computer-science word for a clumsy solution). The kluges Marcus describes in his book are the human mind’s limitations, which he thinks stem mostly from memory. “The thesis of that book, was that human mind is a kluge,” says Marcus, “And one of the principal reasons that I think it’s a kluge is because our memory is so poorly organized relative to how much memory it works.” It then became obvious to Marcus that a memory-enhancing brain chip would be incredibly useful for people. “There are ways that we already have narrow solutions to our memory problems,” says Marcus, but he says they are hacks—plastic devices to organize medicine and pills, electronic devices to find missing car keys, new applications to find misplaced iPhones. “We need all of these things because our memories are so fundamentally disorganized,” he says. While Marcus is not personally working on advancing the science behind his theories, he does know scientists working in this direction. For instance, Miguel Nicolelis of Duke University's Center for Neuroengineering, discovered in 2005 how to make monkeys control robotic arms with their brains, initiating right, left, up, and down movements. Marcus says this is in the right spirit of lab work for translating brain activity, but it still doesn’t grasp how the robot arm would work in between tasks, or remember what movements to instigate in memorized and sequential order. Two other challenges concern Marcus: privacy and equality. The former—securing people’s personal and private memories—seems easiest to overcome, as a computer-based issue. The latter—making sure that the technology is available to everyone—is a crucial consideration. Marcus calls the chip a “steroid for the brain,” and says it will inevitably be made and sold. Therefore, understanding brain code, and connecting it with a computer chip, is the next pivotal frontier, analogous to how cracking the DNA code astronomically progressed science. Computers store information like a stack of trays in a cafeteria, where the last tray placed put down in the stack is the first in line to pick up. This is what Dr. Gary Marcus calls embedded layers—taking care of the most pressing issue at hand. He says that “people are terrible at that. You’re supposed to get groceries, but then you get a phone call. At the end of the day you’re tired. You end up driving home on autopilot." Marcus believes that a memory-enhancing brain chip will help solve these human limitations. “There seem to be really important functions to forgetting,” says Dr. Ellen McGee, a medical ethicist and retired Long Island University C.W. Post professor. While McGee focuses her research on the ethical implications of using any type of neural interfacing, she says it is unclear that a memory-enhancing device will be good for humans. McGee doesn’t think brain chips should be banned altogether, but she does advocate for regulations at a state, national, and international level that will overlook both the production and distribution of neural implants. The creation of a memory enhancing device seems inevitable, so it’s crucial that its use is overseen, she says, because these chips will radically affect humans. “We have memories that cause us trauma,” says McGee, “We have memories that make us guilty. We have memories that if we were flooded with them, might keep us from being able to act in the present, and to enjoy the present. So, it’s not clear how humans with 'total recall' would function." — “Implantable brain chips: ethical and policy issues,” 2001 paper by Dr. Ellen McGee and colleague Dr. Gerald Q. Maguire, Jr.
— “Potential of Using Brain Power to Propel Prostheses advance at Stan...,” a 2006 news release by Stanford University’s School of Medicine. — The Human Hard Drive: How We Make (And Lose Memories), Big Think/Going Mental. VeriChip is the only Food and Drug Administration (FDA)-approved human-implantable radio-frequency identification (RFID) microchip. It is marketed by PositiveID, a subsidiary of Applied Digital Solutions, and it received United States FDA approval in 2004. About twice the length of a dime, the device is typically implanted between the shoulder and elbow area of an individual’s right arm. Once scanned at the proper frequency, the VeriChip responds with a unique 16 digit number which could be then linked with information about the user held on a database for identity verification, medical records access and other uses. The insertion procedure is performed under local anesthetic in a physician’s office. As an implanted device used for identification by a third party, it has generated controversy and debate. Destron Fearing, a subsidiary of Applied Digital Solutions, initially developed the technology for the VeriChip. According to Wired News online, and the Associated Press, there have been research articles over the last ten years that found a connection between the chips and possible cancer. When mice and rats were injected with glass-encapsulated RFID transponders, like those made by VeriChip, they “developed malignant, fast-growing, lethal cancers in up to 1% to 10% of cases” at the site at which the microchip was injected or to which it had migrated. However, the 10% rate was obtained with hemizygous p53-deficient mice, the counterpart of humans with the Li-Fraumeni syndrome, and rates near 1% were more typical. The Verichip corporation responded to this report, which caused a 40% drop in their stock value, by stating that rodent data had been provided to the FDA and did not reflect the effect of the chips in humans or pets. Dogs, alternatively, are more resistant to the formation of malignant soft tissue tumors in response to foreign body insult. Induction of sarcomas by foreign bodies has been reported in humans, and has been described as analogous to rodent foreign body-associated sarcomas and is fairly infrequent. Resolution of the question may be hindered by the long delay in onset of sarcoma induction or other deleterious side effects, analogous to the controversy in the mid 20th century over asbestos exposure and predisposition to mesothelioma. Tommy Thompson, the former Secretary of Health and Human Services, supports the VeriChip as a “useful tool in sharing medical information with health care providers in emergency situations”. Thompson also sits on the board of directors of VeriChip’s parent company Applied Digital Solutions. In June 2007, the American Medical Association declared that “implantable radio frequency identification (RFID) devices may help to identify patients, thereby improving the safety and efficiency of patient care, and may be used to enable secure access to patient clinical information” (Wikepedia). Dr. John Hall is an MD currently practicing in TX and author of "A New Breed"
( if the comments about the surveillance sound unbelievable. Know this - The War on Terror is a Fraud and as a result the mammoth DHS, FBI, CIA security structure built post 911 needs to be tracking someone.... Ordinary Americans are being chosen for that role. http://www.torturedinamerica.org/ . Am I a left wing liberal war protester. NO- I have voted a straight Republican- Conservative ticket since 1980 and had chosen this party as a before I was of age to vote. The Left- Right - Democrat- Republican paradigm is a fraud. The Global Elite runs the show - Global Bankers, Federal Reserve, Bilderbergs, the same ones who hold and finance our debt. After more than a year and a half. I often wondered why I had not been cleared of whatever law enforcement was looking for. In particular Homeland Security, CIA or NSA. On a daily basis I was followed by military jets and planes. I watched millions being spent following an innocent man. I knew my complaint of an unlawful search and seizure was one reason for the continued harassment. Because no one is willing to admit a mistake was made.I then began to wonder why the surveillance on the ground and in the air picked up immensely every time the mother of my sons Christopher 5 and Cayden 4 who live in the city of Ventura are dropped at my residence in the city of Santa Barbara. My letter to the Attorney general requesting an investigation highlighted my concerns as they relate to injuries and strange symptoms that my sons were experiencing while living at the same Ventura address where I was a victim of some type of electromagnetic device. I began to record my sons' attempting to sleep and it became increasingly clear to me that something was making them cry and flail all over their bed. I watched them stop and start as if someone was controlling their body parts. After observing this behavior for several months, I began to get the feeling that something was triggering the behaviors. After conducting research, I was convinced something was implanted in their teeth as they both grinded their teeth profusely and tossed and turned all night long almost in a rhythmic movement as if they were puppets. Both of the boys would be in a deep sleep, but their body and limbs were flailing about. The episodes seemed to occur from the time they fell asleep until the morning hours like clock work. It was obvious to me someone was causing them to toss and turn all night and that something had to be making them toss and turn all night except for a few breaks. I finally came to the realization that someone was causing them to behave in that manner. After conducting research and matching it with my observations, I decided to drive to Sacramento in order to have my sons participate in a Radio Frequency Scan. Both boys came up positive and they both have two biochips in their little bodies that were implanted by someone.We know exactly where the boys received the implants in Ventura County as they had no appointments elsewhere. According to the expert who performed the scan, the biochips were placed in them with a needle. The attached document - www.freedomfchs.com/sb362.jpg - describes the biochip. The scan was performed by Jesse Beltan, who works closely with Dr.John Hall, the author of A New Breed Satellite Terrorism in America. Dr. Hall states that the chips are designed to track, but mostly torture its intended targets. My purpose for the trip to Sacramento was to confirm my fear that something had been placed inside of my sons in order for them to move about in their sleep the way they are. Last but not least, Mr. Beltran asked me to be scanned also. I was shocked to find that I had three biochips in me. When asked when 'was the last time I was in a hospital'?, I replied sometime during the month of August 2010 after I was admitted overnight for hypertension due to being profiled and followed without cause. It is presumed that I was injected at that time by someone so that I could be tracked as the surveillance had just begun. That explains how they knew my every movement inside and outside of my residence. The individuals who placed the chips knew they were there all along and they knew that I was starting to figure this all out. Thanks to Mr.Jesse Beltran and Dr.John Hall, I am able to expose this travesty. After the unlawful search and seizure of my vehicle on September 15, 2010, the perpetrators found a way to further track an innocent man and his children which is evidenced in the Xray's depicting the chips. This is criminal. As I traveled back from the bay area today, I observed contrail floating all over the place as the jets followed my every move all the way back to Santa Barbara. This is clearly a blunder by Homeland Security, the military or one of our intelligence agencies. If you would like to verify my claims please feel free to contact Mr.Jesse Beltran at winlinquist@gmail.com. He has a comprehensive report of the frequency scans and has been performing such services for years. A Danish national has filed a writ against Alexandra Hospital (AH) for allegedly planting a microchip in him during a 1988 operation, which he claimed later caused him mental distress due to being constantly monitored. Mr Honore, 54, added the metal piece was implanted in him during an operation at AH more than two decades ago – the last time he had undergone surgery in his chest and lung. “(Mr Honore) also discovered and experienced that strange people on the streets would approach and speak to (him) about strange subject matters or pass strange irrelevant comments,” according to the papers filed. Mr Honore said that his subsequent discovery of being constantly tracked left him in a “perpetual state of apprehension and fear for the safety of his life”. It also prevented him from holding on to a job. In his lawsuit, Mr Honore is now alleging that employees of AH who had then operated on him implanted the microchip in him intentionally, causing “exceptional harm and lifelong suffering”. He also said that the alleged act constitutes a trespass on his body. She added that, after the hospital was informed of the lawsuit, AH has taken steps to convey to the patient’s lawyer (Mr Quek) that Jurong Health Services Pte Ltd has been wrongly identified as the defendant in the suit. Through use of our VeriMed system, a person can be scanned for the unique, 16-digit identification number on the implanted microchip, enabling access from our or a third party’s database to that person’s pre-approved information, including the person’s name, primary care physician, emergency contact information, advance directives, and, if the person elects, other pertinent data, such as personal health records. We obtain the implantable microchip used in our VeriMed, VeriGuard and VeriTrace systems from Digital Angel Corporation, a majority-owned subsidiary of our parent company, Applied Digital Solutions, Inc., under the terms of a supply agreement. Digital Angel, in turn, obtains the implantable microchip from a subsidiary of Raytheon Company under a separate supply agreement. The technology underlying these systems is covered, in part, by U.S. Patent No. 5,211,129, “Syringe-Implantable Identification Transponders.” In 1994, Destron/IDI, Inc., a predecessor company to Digital Angel, granted a co-exclusive license under this patent, other than for certain specified fields of use retained by the predecessor company, to Hughes Aircraft Company, or Hughes, and its then wholly-owned subsidiary, Hughes Identification Devices, Inc., or HID. The specified fields of use retained by the predecessor company do not include human identification or security applications. The rights licensed to Hughes and HID were freely assignable, and we do not know which party or parties currently have these rights or whether these rights have been assigned, conveyed or transferred to any third party. We source the implantable microchip indirectly from a subsidiary of Raytheon Company, with which Hughes, then known as HE Holdings, Inc. was merged in 1997. However, we have no documentation that establishes our right to use the patented technology for human identification or security applications. We do not anticipate generating more than nominal revenue from the sale of the VeriMed, VeriGuard or VeriTrace systems prior to the expiration of the patent in April 2008. Hughes, HID, any of their respective successors in interest, or any party to whom any of the foregoing parties may have assigned its rights under the 1994 license agreement may commence a claim against us asserting that we are violating its rights. If such a claim is successful, sales of our VeriMed, VeriGuard and VeriTrace systems could be enjoined, and we could be required to cease our efforts to create a market for these systems, until the patent expires in April 2008. In addition, we could be required to pay damages, which may be substantial. Regardless of whether any claimant is successful, we would face the prospect of the expenditure of funds in litigation, the diversion of management time and resources, damage to our reputation and the potential impairment in the marketability of our systems even after the expiration of the patent, which could harm our business and negatively affect our prospects. We face the risk of adverse claims and litigation alleging our infringement of the intellectual property rights of others. If infringement claims are brought against us or our suppliers, including, in the case of our implantable microchip, Digital Angel, these assertions could distract management and necessitate our expending potentially significant funds and resources to defend or settle such claims. We cannot be certain that we will have the financial resources to defend ourselves against any patent or other intellectual property litigation. obtain licenses to the disputed rights, which could require us to pay substantial upfront fees and future royalty payments and may not be available to us on acceptable terms, if at all, or to cease marketing the challenged products. Our inability to safeguard our intellectual property may adversely affect our business by causing us to lose a competitive advantage or by forcing us to engage in costly and time-consuming litigation to defend or enforce our rights. We rely on copyrights, trademarks, trade secret protections, know-how and contractual safeguards to protect our non-patented intellectual property, including our software technologies. Our employees, consultants and advisors are required to enter into confidentiality agreements that prohibit the disclosure or use of our confidential information. We also have entered into confidentiality agreements to protect our confidential information delivered to third parties for research and other purposes. There can be no assurance that we will be able to effectively enforce these agreements, the confidential information will not be disclosed, others will not independently develop substantially equivalent confidential information and techniques or otherwise gain access to our confidential information, or that we can meaningfully protect our confidential information. Costly and time-consuming litigation could be necessary to enforce and determine the scope of our confidential information, and failure to maintain the confidentiality of our confidential information could adversely affect our business by causing us to lose a competitive advantage maintained through such confidential information. Disputes may arise in the future with respect to the ownership of rights to any technology developed with third parties. These and other possible disagreements could lead to delays in the collaborative research, development or commercialization of our systems, or could require or result in costly and time-consuming litigation that may not be decided in our favor. Any such event could have a material adverse effect on our business, financial condition and results of operations by delaying our ability to commercialize innovations or by diverting our resources away from revenue-generating projects. Our efforts to protect our intellectual property may be less effective in some foreign countries where intellectual property rights are not as well protected as in the United States. The laws of some foreign countries do not protect intellectual property to as great an extent as do the laws of the United States. Policing unauthorized use of the intellectual property utilized in our systems and system components is difficult, and there is a risk that our means of protecting our intellectual property may prove inadequate in these countries. Our competitors in these countries may independently develop similar technology or duplicate our systems, which would likely reduce our sales in these countries. Furthermore, some of our patent rights may be limited in enforceability to the United States or certain other select countries, which may limit our intellectual property rights abroad. Our competitors, including those who have greater resources and experience than we do, may commercialize technologies that make ours obsolete or noncompetitive. There are many public and private companies, universities, governmental agencies and research organizations actively engaged in research and development of RFID and other competing technologies with the same or similar functionality as our systems and that target the same markets that we target. Our active RFID systems, such as our infant protection, wander prevention and asset/staff location and identification systems, utilize a zonal, also known as cell ID, system in which a network of readers are positioned to cover a defined area, including points of ingress or egress, to read tagged persons or objects within the defined area. There are a number of other technologies, such as UHF-based active RFID technologies, lower power Ultra Wide Band-based location technologies, 802.11 and Zigbee-based location and wireless networking technologies, and advanced, long range, encrypted passive RFID technology, that are being developed and sold that can be employed for our target applications. One or more of these technologies may prove to be a better or more cost-effective solution than our RFID systems for customers in our target markets and thus achieve greater market acceptance than the technologies used in our systems. If this were to occur, our ability to sell our systems, as well as our results of operations, financial condition and business prospects, would be adversely affected. Some of our current competitors, as well as companies who utilize RFID technologies in applications outside of our target markets, have significantly greater financial, marketing and product development resources than we do. Low barriers to entry across most of our product lines may result in new competitors entering the markets we serve. If a current or future competitor were to successfully develop or acquire rights to more effective or lower cost systems for applications targeted by our systems, then sales of our systems could suffer and our business, results of operations and financial condition could be materially and adversely affected. We have been in the process of endeavoring to create a market for our VeriMed system since the FDA cleared the VeriMed system for use for patient identification and health information purposes in October 2004. To date, we have only generated approximately $0.1 million in revenue from sales of the microchip inserter kits, significantly less than we had projected at the beginning of 2006. We may never achieve market acceptance or more than nominal or modest sales of this system. Many people who fit the profile for which the VeriMed system was designed may not be willing to have a microchip implanted in their upper right arm. Physicians may be reluctant to discuss the implant procedure with their patients until a greater number of hospital emergency rooms have adopted the VeriMed system as part of their standard protocol. The media has from time to time reported, and may continue to report, on the VeriMed system in an unfavorable and, on occasion, an inaccurate manner. For example, there have been articles published asserting, despite at least one study to the contrary, that the implanted microchip is not magnetic resonance imaging, or MRI, compatible. Privacy concerns may influence individuals to refrain from undergoing the implant procedure or dissuade physicians from recommending the VeriMed system to their patients. Misperceptions that a microchip-implanted person can be “tracked” and that the microchip itself contains a person’s basic information, such as name, contact information, and personal health records, may contribute to such concerns. 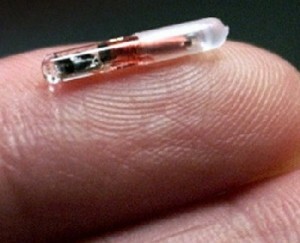 Misperceptions and/or negative publicity may prompt legislative or administrative efforts by politicians or groups opposed to the development and use of human-implantable RFID microchips. In 2006, a number of states have introduced, and at least one state, Wisconsin, has enacted, legislation that would prohibit any requirement that an individual undergo a microchip-implant procedure. While wesupport all pending and enacted legislation that would preclude anything other than voluntary implantation, legislative bodies or government agencies may determine to go further, and their actions may have the effect, directly or indirectly, of delaying, limiting or preventing the use of human-implantable RFID microchips or the sale, manufacture or use of RFID systems utilizing such microchips. At present, the cost of the microchip implant procedure is not covered by Medicare, Medicaid or private health insurance. At present, no clinical studies to assess the impact of the VeriMed system on the quality of emergency department care have been completed. In light of these and perhaps other factors, it is difficult to predict whether our VeriMed system will achieve market acceptance, how widespread that market acceptance will be, and the timing of such acceptance. Accordingly, we are uncertain as to whether we will generate the level of future revenue and revenue growth we have forecast from sales of the VeriMed system. We believe that sales of our implantable microchip, and the extent to which our VeriMed system achieves market acceptance, will depend, in part, on the availability of insurance reimbursement from third-party payers, including federal and state governments under programs, such as Medicare and Medicaid, and private insurance plans. Insurers may not determine to cover the cost of the implant procedure, or it may take a considerable period of time for this to occur. We believe that sales of our implantable microchip, and the extent to which our VeriMed system achieves market acceptance, will depend, in part, on the availability of insurance reimbursement from third-party payers, including federal and state government programs, such as Medicare and Medicaid, private health insurers, managed care organizations and other healthcare providers. Both governmental and private third-party payers are increasingly challenging the coverage and prices of medical products and services, and require proven efficacy and cost effectiveness for reimbursement. If patients undergoing the microchip implant procedure, or health institutions and doctors using the VeriMed system, are not able to obtain adequate reimbursement for the cost of using these products and services, they may forego or reduce their use. While we are in the process of facilitating and, in one case, funding clinical studies that may demonstrate the efficacy of the VeriMed system, which we believe will make it more likely that government and private insurers will cover the cost of the microchip implant process, it may take a considerable period of time for this to occur, if, in fact, it does occur. If government and private insurers do not determine to reimburse the cost of the implant process, we would not expect to realize the anticipated level of future sales of our implantable microchip and the database subscription fees. Our sales of systems that incorporate our implantable microchip may be enjoined by third parties who have rights to the intellectual property used in these systems and we may be required to pay damages which would have an adverse effect on our business. We may face a claim that we are violating the intellectual property rights of one or more third parties with respect to U.S. Patent No. 5,211,129,“Syringe-Implantable Identification Transponders.” If such a claim is successful, we could be required to cease engaging in activities to market our systems that utilize the implantable microchip and to pay damages, which may be substantial. We obtain the implantable microchip used in our VeriMed, VeriGuard and VeriTrace systems from Digital Angel, a majority-owned subsidiary of our parent company, Applied Digital, under the terms of a supply agreement. Digital Angel, in turn, obtains the implantable microchip from a subsidiary of Raytheon Company under a separate supply agreement. The technology underlying our VeriMed, VeriGuard and VeriTrace systems is covered, in part, by U.S. Patent No. 5,211,129. In 1994, Destron/IDI, Inc., a predecessor company to Digital Angel Corporation, granted a co-exclusive license under this patent, other than for certain specified fields of use retained by the predecessor company, to Hughes Aircraft Company, or Hughes, and its then wholly-owned subsidiary, Hughes Identification Devices, Inc., or HID. The specified fields of use retained by the predecessor company do not include human identification and security applications. The rights licensed in 1994 to Hughes and HID were freely assignable, and we do not know which party or parties currently have these rights or whether these rights have been assigned, transferred or conveyed to any third party. We source the implantable microchip indirectly from a subsidiary of Raytheon Company, with which Hughes, then known as HE Holdings, Inc. was merged in 1997. However, we have no documentation that establishes our right to use the patented technology for human identification and security applications. Hughes, HID, any of their respective successors in interest, or any party to whom any of the foregoing parties may have assigned its rights under the 1994 license agreement may commence a claim against us asserting that we are violating its rights. If such a claim is successful, sales of our VeriMed, VeriGuard and VeriTrace systems could be enjoined, and we could be required to cease our efforts to create a market for these systems, until the patent expires in April 2008. In addition, we could be required to pay damages, which may be substantial. Regardless of whether any claimant is successful, we would face the prospect of the expenditure of funds in litigation, the diversion of management time and resources, damage to our reputation and the potential impairment in the marketability of our systems even after the expiration of the patent, which could harm our business and negatively affect our prospects. Even if our VeriMed system achieves some level of market acceptance, the anticipated significant and growing recurrent revenue from microchip-implanted persons’ subscribing to our database may not be realized. Our business model envisages that our VeriMed system will achieve some level of penetration within our target market for such system: the approximately 45 million at-risk people in the United States with cognitive impairment, chronic diseases and related conditions, or implanted medical devices. The model also anticipates our deriving significant and growing recurrent revenue from subscriptions to our database by persons implanted with our microchip. However, a person implanted with our microchip may decide not to subscribe to our database if, for example, the hospital emergency room where he or she would most likely be taken in an emergency maintains its own database. We do not currently anticipate that a significant percentage of VeriMed-adopting hospitals and other healthcare facilities will choose to provide databases for this purpose. However, future regulatory changes, such as in connection with the U.S. government’s efforts to address inefficiencies in the U.S. healthcare system related to information technology, could spur hospitals and other healthcare facilities to establish systems to maintain electronic health records. This might have the effect of reducing the number of people implanted with our microchip who might otherwise subscribe to our database which could, in turn, negatively affect the future revenue that we anticipate we will derive from the VeriMed system. False claims laws prohibit anyone from knowingly presenting, or causing to be presented, for payment to third-party payers, including Medicare and Medicaid, which currently do not provide reimbursement for our microchip implant procedure, claims for reimbursed drugs or services that are false or fraudulent, claims for items or services not provided as claimed, or claims for medically unnecessary items or services. Our activities relating to the reporting of wholesale or estimated retail prices of our VeriMed system, the reporting of Medicaid rebate information, and other information affecting federal, state and third-party payment for the VeriMed system, will be subject to scrutiny under these laws. We may be unable to increase our sales of infant protection and wander prevention systems outside of North America. political unrest, terrorism and war. "Omitting the cloning threat from its SEC documents is a serious oversight that could affect the value of VeriChip's stock. This is materially relevant information, considering VeriChip's claim that its product could be used to tighten security in facilities like nuclear power plants," she adds. "A chilling story about an emerging future in which spychips run amok as Big Brother and Big Shopkeeper invade our privacy in unprecedented ways."